Palmeiras went to Santos this Sunday to play agianst Santos at Vila Belmiro. Palmeiras began playing better but was surprised by Santos which made 1 x 0. 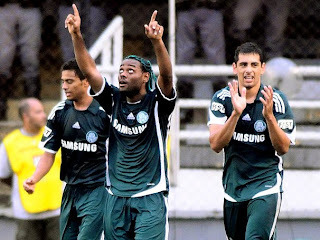 Muricy Ramalho Palmeiras' coach, substituted Obina for Robert. The game changed and Palmeiras scored 3 goals and maintained the lead. Vagner Love scored the goal. Me Nephew Jebrod has his own footblall team. His beats all of them. Interesting information, but try to add more of your own thoughts or analysis to this. You have some, but this just needs to be longer.